Team Evotri: Announcing Book Bike Project! From time to time on my blog I will allude to my day job as a librarian at Illinois Wesleyan University. My career choice intersects with my triathlon endeavors more than often than you would imagine. In particular, I attribute some of my success as a long course triathlete to my abilities to research all the minutiae of racing, training, nutrition, recovery, etc. Being able to evaluate and manage large amounts of information has made me a better triathlete and an even better coach. It was only recently that I came across a way to even further integrate many of my life-long passions: literacy, sustainability, fitness and education. 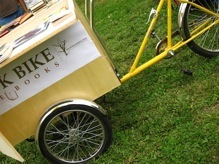 Enter the Book Bike! 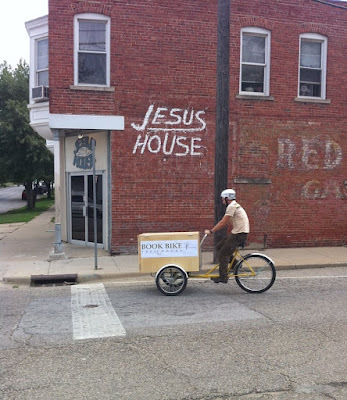 The Book Bike idea came from a great guy up in Chicago named Gabe Levinson. Gabe has a website about his book bike project here: http://www.bookbike.org/about/ . The beauty of the idea is in its simplicity. A bicycle is one of the most low-tech forms of transportation out there. Riding reduces carbon emissions and promotes physical fitness. Now take a three-wheeled bike and mount a book case on the front! In the vein of the K.I.S.S. principle (Keep it Simple Stupid) the concept is to ride the book bike to public places and just give away books- no strings attached! 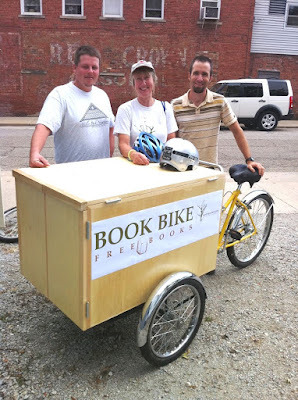 I forwarded the video to some of my library colleagues and Karen Schmidt, our library director, jumped on the concept and started making plans to bring a book bike to Bloomington. Karen is on the Bloomington City Council and part of the West Bloomington Revitalization Project (WBRP). The Book Bike supports several parts of the WBRP strategic plan, including education, engagement with youth, and greening initiatives. 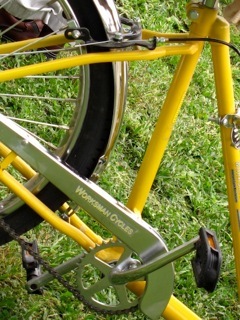 The bike itself is a US-made front load Worksman Tricycle. Unlike a kids tricycle, it has two wheels up front that allow the bike to support a heavy load. These bikes are used in large factories for internal deliveries and by a variety of street vendors. We worked with our local bike shop, Vitesse Cycle, to coordinate ordering and assembling the bike. The book case was designed and donated by Mark Fagerland of Unique Design in Normal, IL. It sits on the front platform and then when you get to your location, it unfolds and locks to display the books. Steering the bike is surprisingly easy with the two wheels up front. Currently the bike is set up as a single speed, but we are looking at re-working the gear ratio to better manage hills! The bike itself probably weighs 75-100 lbs. The book case is another 75 lbs. When you add rider weight to that equation, you are talking about quite a bit of weight! 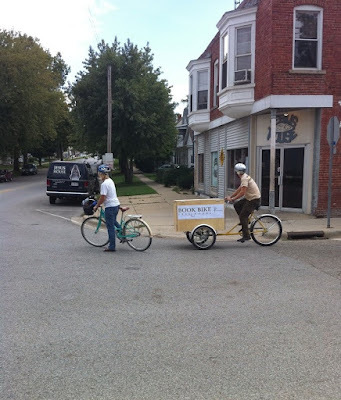 I had the distinction of being the guinea pig rider for the first 10-block maiden voyage of the book bike! The one small hill was somewhat challenging even for an experienced cyclist! Once we get the bike geared down, it should be surprisingly easy to ride around town. Our Book Bike debut was at a a Fall Family Fun Festival near some community garden plots in West Bloomington. The bike itself drew more interest from the adults, while some of the kids in attendance grabbed some free books before rain forced the bike inside. 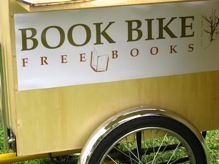 We are looking for donations of new and gently used books, as well as financial donations to support the Book Bike. 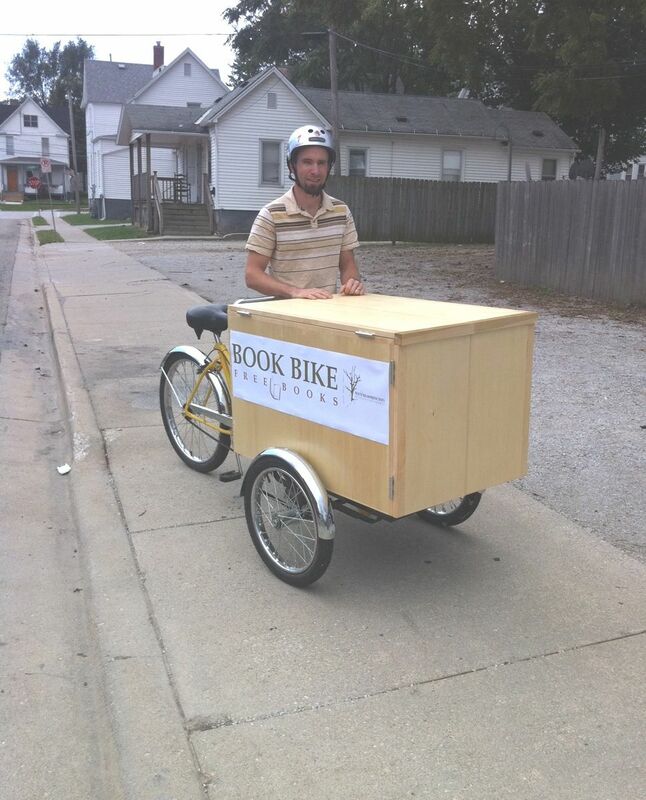 Donations for the book bike should be marked as such and sent to: Illinois Prairie Community, 202 N Prospect Rd, Bloomington, IL 61704-7914. Book donations can be dropped off at the WBRP office.